This is repost from last spring. I found these fungi growing at Falls Creek SNA earlier in the week. I've seen them elsewhere in the early spring. They can be easy to overlook because they often blend in with the leaf litter. 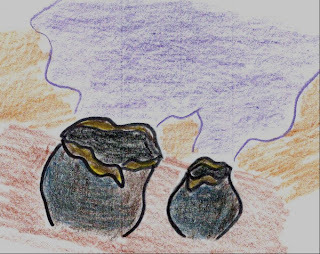 The name Devil's Urn sounds ominous, but they are harmless, and actually important because they are one of the countless organisms quietly and inconspicuously recycling the components of dead wood into the soil. They decay the glucan of wood, which kind of acts like a glue that holds the other components of wood together (lignin and cellulose) and cause a rot known as soft rot. The fruiting body, or urn, doesn't grow directly from the rotten wood, but usually from the ground right next to the rotten wood. I've read that you can blow over the Devil's Urn and see a cloud of spores being released. I haven't tried this, but I will next time I come across the Devil's Urn. Falls Creek is an amazing place. Visit if you can, walk lightly, and watch closely. I saw my first ever Louisiana Waterthrush there. But this isn't a birding blog . . .